When a friend or relative is grieving, it's very difficult to choose just the right sympathy gift to express your wishes. Finding a personalized option is even more challenging. You want something that looks special, and which also has a connection to the person who has passed on. Fortunately, Captured Wishes specializes in exactly this kind of gift. We find a way to capture the feelings you are having trouble expressing. At this difficult time, Captured Wishes supplies the perfect tone for your sympathy gift. This gift comes in packaging of a unique design. The wish vessel arrives in a puffy triangle gift box, which transforms itself into a stand-alone verse card by simply flipping back the flaps (instructions are provided). Each flap has space for a loved one to sign. Because you can specify either initials, or the words Grandad, Grandma, Mother, Mum, or Father, this is a unique way to make the sympathy gift personal to the loved one who has passed away. "This little bottle of wishes is a gift to you with promise and belief that the day will come when your sorrow shall pass, your grief shall lift, and your heart will begin to heal. And when your tears of remembrance return to you, they will flow softly and caress your soul like a gentle spring rain on a window, full of hope, peace, and joy." The Wish vessel itself is in the shape of a water droplet (not a tear), that is almost ready to form into a tear. This is symbolic of how the tears of sorrow will become gentle raindrops of peace, hope and joy. 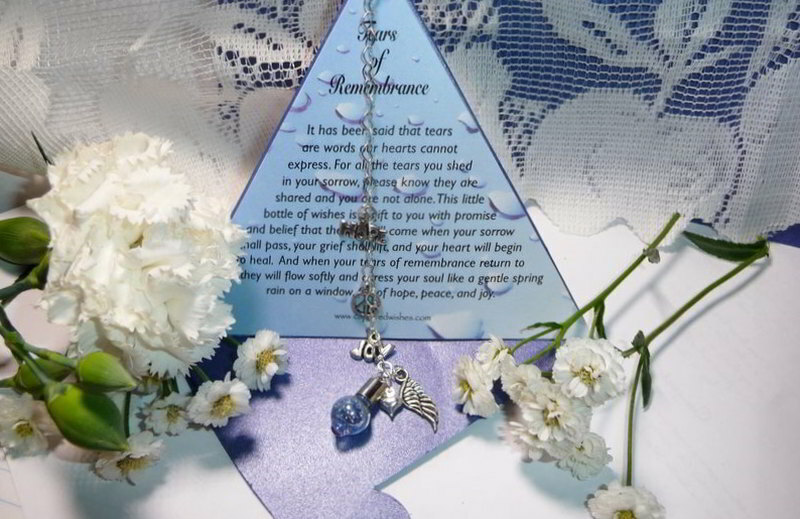 Tears of Remembrance is a smart and compact sympathy gift that stands out. It is SO different from traditional sympathy gifts, and it can be personalized -- which brings the person who gives this gift closer to the recipient who is bearing the loss. It is heartfelt support for the griever, because the gift remembers the deceased, and also reminds the recipient of the person who truly shows how deeply they care about this person's loss. The tear-shaped bottle (15mm height x 10mm wide) comes complete with a suction cup for display in a window or on a mirror to catch the light. This is a complete package - so personal, yet so easy. Arrives with verse card, gift box, and perfectly adorned wish vessel. See more Chic and Unique Gift Ideas!